Our source claims that a ‘trusted source’ of theirs has given them a copy of a training manual that HTC distributed to the many thousands of retailers in the U.S. selling their new HTC One M8. 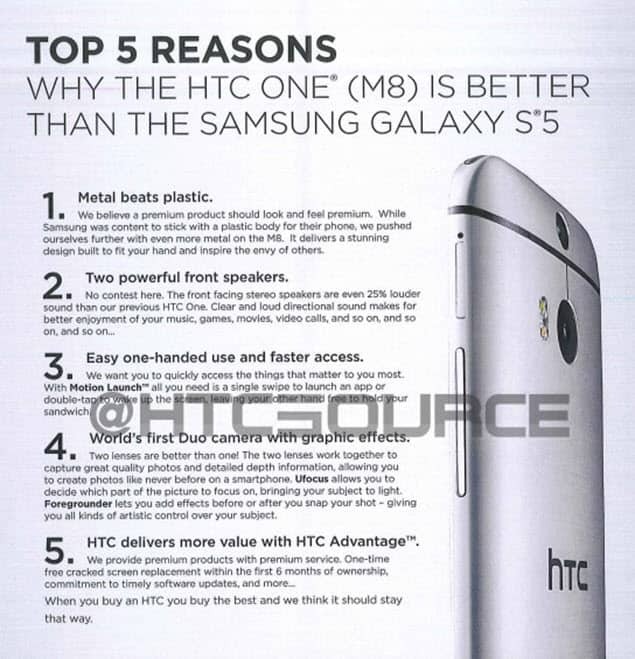 Most representatives have already had their training, but the title of this directive is plain and simple, “Top 5 Reasons Why the HTC One (M8) is Better Than the Samsung Galaxy S5.” They break it down to five reasons: Metal Body, Front Speakers, Easy one-handed use, Duo Camera, and HTC Advantage program. Are these really compelling enough reasons to buy the HTC One M8 over the Samsung Galaxy S5? Let’s take a closer look and see if they can convince us. Reason Two is Two Powerful Front Speakers – Okay, here there is just no arguing that dual, front-facing, stereo speakers on a smartphone is a helluva an idea. It is such a great idea that I am surprised that all manufacturers of premium devices do not adopt this feature. When listen to a video, using them as a speakerphone or the occasional time when you need to listen to music with no earbuds or headphones, this is a terrific idea and selling point. 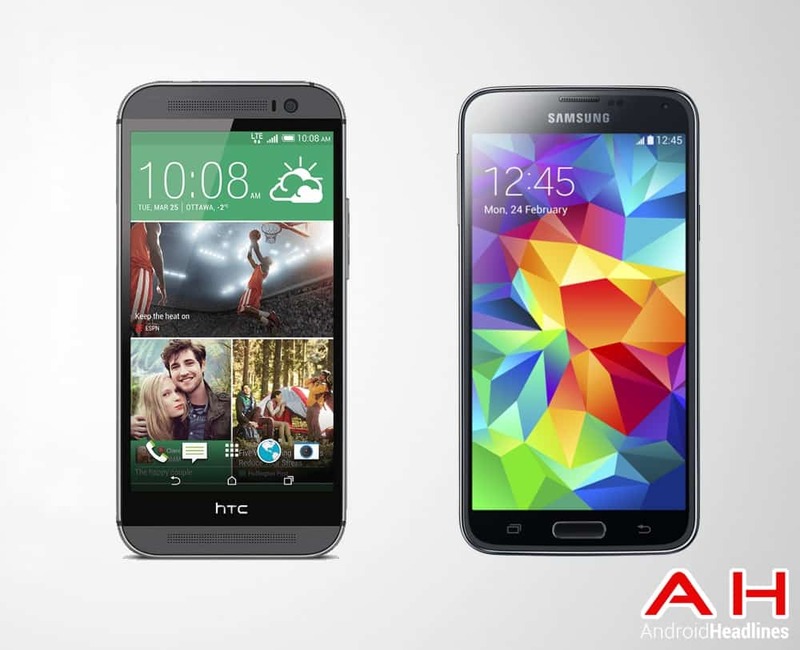 Reason Three is Easy One-Handed Use and Faster Access – The dimensions of the HTC One M8 are 146.4 x 70.6 x 9.4 mm and weighs in at 160 grams while the Samsung Galaxy S5 measures out at 142 x 72.5 x 8.1 mm and weighs 145 grams. The Samsung is only 1.9 mm wider, yet smaller in every other dimension, including weight, and the Galaxy S5 also offers a one-handed option that allows you to swipe and bring the keyboard closer to the right or left, depending which way you swipe – it does not seem that HTC read the size or options regarding the new Galaxy S5. Reason Four is the World’s First Duo Camera With Graphic Effects – HTC claims that two cameras are better than one and that may be true if your device was known for outstanding picture-taking, but it is not. I am not saying that the HTC One series does not take a nice picture, but other cameras, and certainly the Samsung Galaxy S and Note series are known for there great photographs and outstanding software, so it will take more than a 4MP UltraPixel camera to convince me otherwise. The Galaxy S5’s real-time HDR mode displays what the photo will look like before you snap the picture and its Selective Focus Shooting mode will capture the shot at different focal lengths so you can select where you want the focus of the picture to be AFTER you take the shot…much like HTC’s Duo Camera mode. Reason Five is that HTC Delivers More Value With HTC Advantage – HTC will replace, for free, one cracked screen within the first six months of ownership – a compelling reason? I have owned multiple cellphones and smartphones since 1991 and I have NEVER cracked even one of my screens. It will be interesting to see how many displays HTC actually replaces for free…seems like grasping at straws for the fifth reason. They also mention their commitment to faster software updates, which is what all of the manufactures are spouting off lately. In the end you will have to be the one that decides if these five reasons are enough to convince you to buy a HTC device – the metal body looks nice and speakers sound great, but one needs more than just looks and sound when deciding to make a possible two-year commitment to a device especially when most people put a case on their device and use earbuds. Please let us know on our Google+ Page what you think about these five reasons…as always, we would love to hear your opinions. The post HTC Training Manual Suggests Five Reasons the HTC One M8 is Better Than the Samsung Galaxy S5 appeared first on AndroidHeadlines.com |.